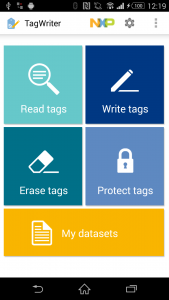 NXP TagWriter, with more than 500,000 downloads from Google Play Store, allows users to easily store NDEF messages that execute desired actions when an NFC tag is tapped. These actions may be opening a website, engaging Bluetooth pairing, or exchanging information, such as contact details. The data stored in the NFC tag can later be protected, erased and copied. In addition, NXP TagWriter provides the possibility to share information between NFC devices, scanning QR codes and transfering the information to NFC tags, and many more features as well. The Android application, written in Java, fully supports the NFC Forum up to Type 4 Tag portfolio.